toads – Tour Guide Mark – Let's Go Exploring! Note: Originally published in September 2017, this trip report was updated in March 2019 by the author to read more like a travel article. In Oregon’s Cascade Range an old tree stood guard over a forgotten story. The memory was about an explorer named Judge John Breckenridge Waldo and his intrepid spirit was that of John Muir and Henry David Thoreau. Waldo is the unsung grandfather of Oregon’s protected lands. It is because of his perseverance that six national forests, Crater Lake National Park, and over a dozen wilderness areas exist today. Yet, few remember Waldo’s name or celebrate his achievements. A photo of Camp Edith (circa 1890) taken at Waldo Lake, Oregon. I saw this while researching the journals and letters of conservationist Judge John Breckenridge Waldo at the University of Oregon archives. 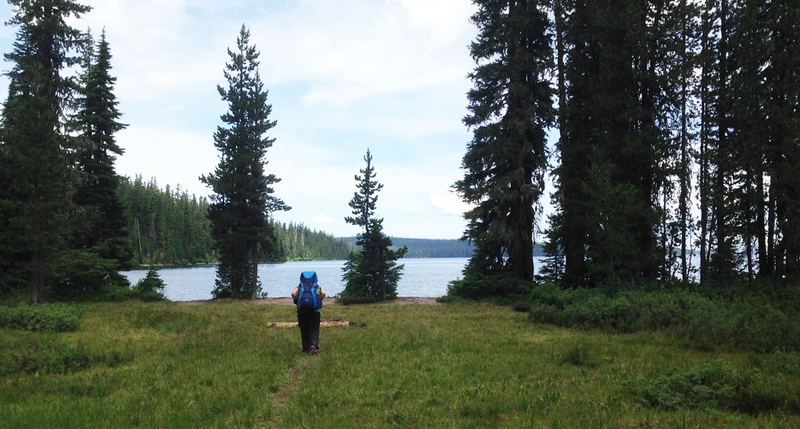 I’ve hiked all over Waldo Lake and never encountered this camp. Where was it? I’ve spent the past year reading, inquiring, and trying to find out where this camp might be, but with little luck. Some fieldwork was needed. I decided to lead a trip with other curious folks to find this historic location using this photo as one of our only clues. The tall perpendicular woods and glassy mountain lake made seeing this old tree even more intoxicating. A year earlier while researching Waldo I spied a grainy black and white photo. 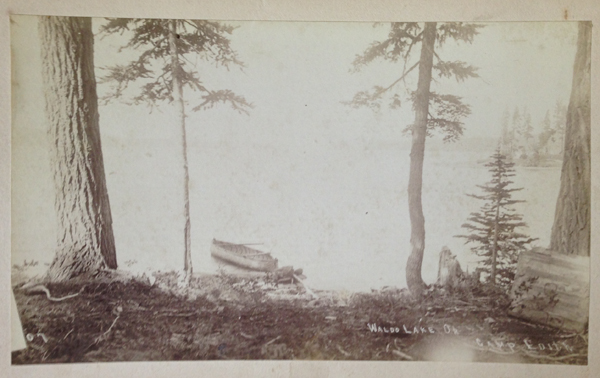 The picture was snapped in 1890; it revealed a couple of trees and a canoe by a lake with the handwritten text, “Camp Edith, Waldo Lake.” An interesting yet unremarkable image, except that Camp Edith wasn’t referenced on any map. After a year of research, my fellow explorers and I stood before those words carved into the tree’s hardwood — it was Waldo’s “lost” campsite. Thank you, John B. Waldo, for helping us to enjoy such beautiful places! A photo of a meadow and Mount Ray, Waldo Lake area. 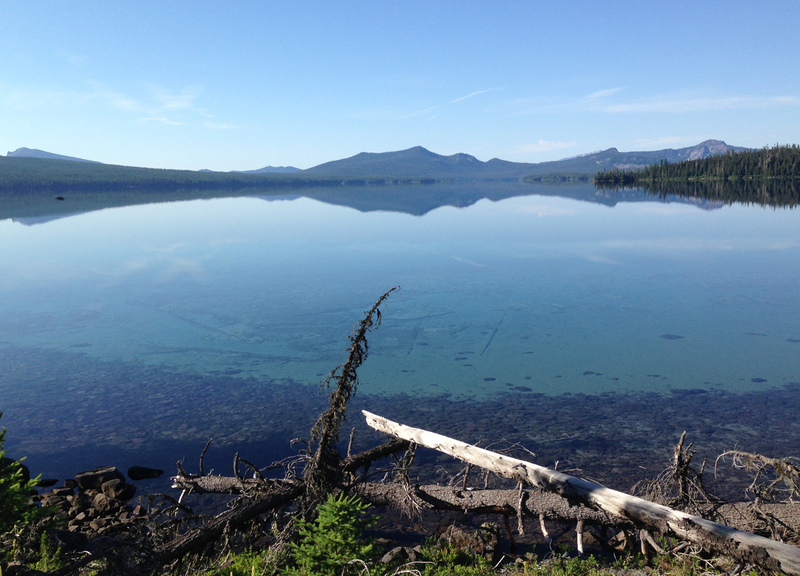 Our morning started with sunlight enriching the blue and turquoise waters of Waldo Lake. The radiant vista poured 5-miles into the distance and an additional 2 miles at breadth. As the sun rose further into the sky it revealed depths of 60 feet or more in the crystalline-like liquid. 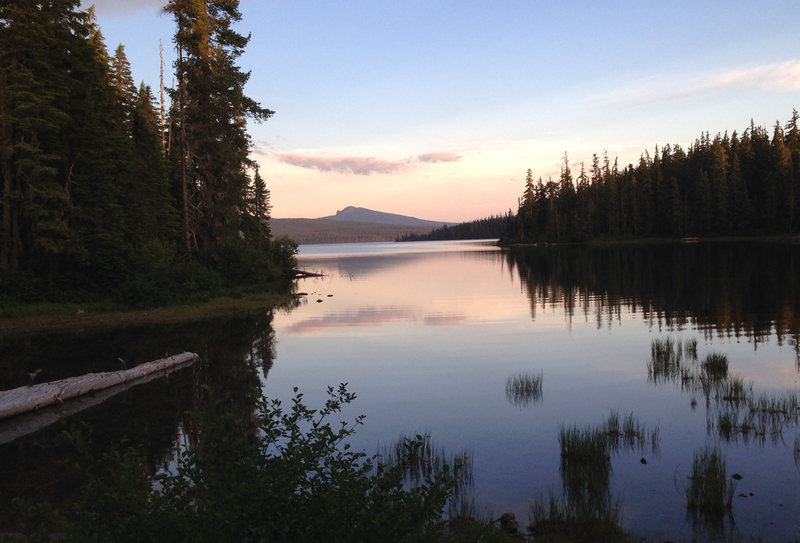 The beautiful Waldo Lake in Oregon’s Cascade Range. 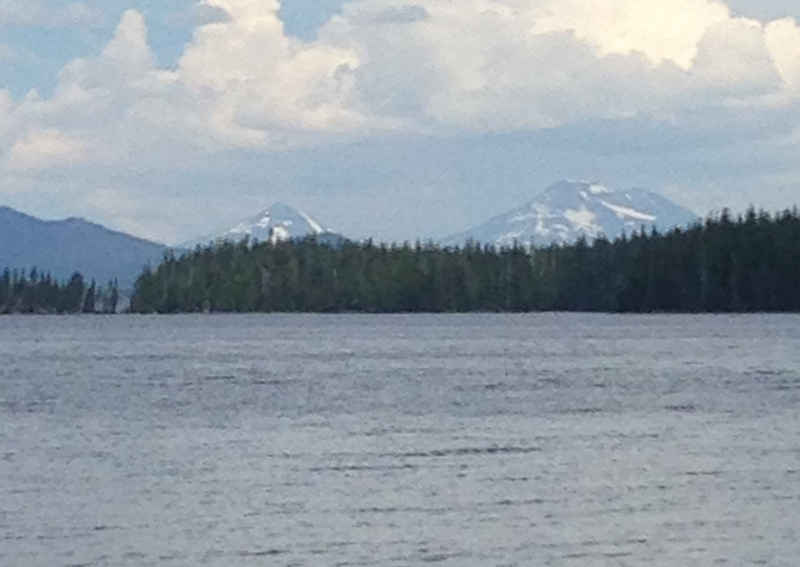 Waldo Lake is 10 square miles in area. The lake is a gas-free zone, only human-powered boats are allowed. From 1877 to 1907 Waldo extensively explored and chronicled the “untrammeled nature” of Oregon’s Cascades. He believed that modern life had “narrowing tendencies” on a person and that wilderness allowed difficulties to “be perceived and corrected, and the spirit enlarged and strengthened.” Waldo was a reflective man who did not seek publicity. Rather, he quietly and diligently advanced his vision: a 300-mile long protected swath along Oregon’s mountainous crest from the Columbia Gorge to the California border. Upon returning from his expeditions he spent countless hours increasing public awareness through letter writing and using his resources as a State Legislator and Chief Justice of Oregon’s Supreme Court to advocate for preservation. Part of the marshy shore of Waldo Lake. The following winter I jumped into reading a rare 500-page copy of Waldo’s transcribed diary. During his treks, he traveled for months at a time to nourish his insatiable wanderlust and love of the Cascades. But like many travelers, he was often homesick. To lessen the loneliness he christened a favorite camping site in honor of his daughter, Edith. A colleague blazed the camp’s name into a tree trunk. The snow had melted in the mountains and some ground reconnaissance was needed. 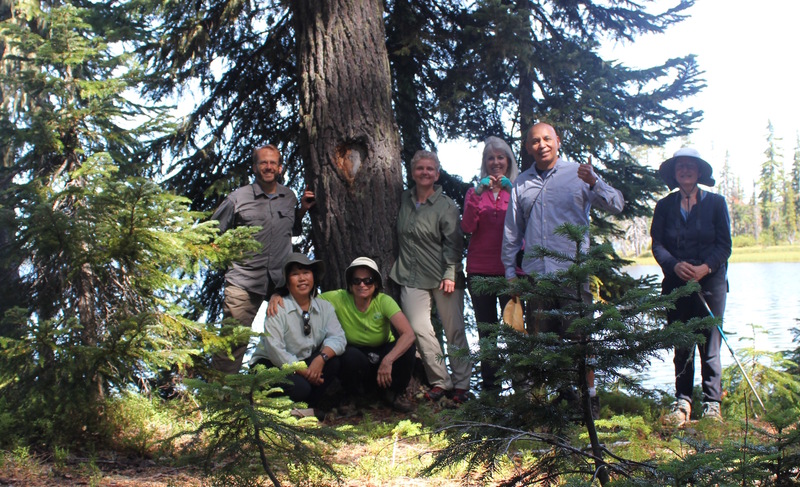 I enlisted several members from a local hiking group to join me at Waldo Lake. We walked into the forest to find “the tree” provisioned with a photo from 1890, a few telling diary entries, and the mystifying advice of an old hippie. We had unearthed a sumptuous moment of discovery. 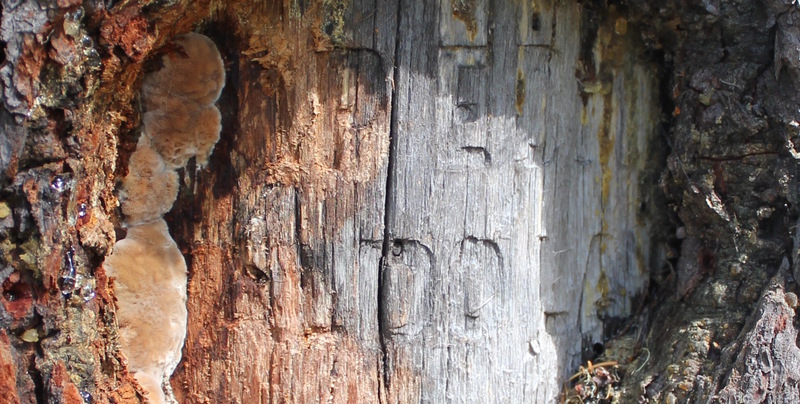 A close-up of the Camp Edith tree, part of the “Camp Edith, Waldo Lake” inscription is still visible. We departed Camp Edith carrying Waldo’s story with us — our spirits nourished and renewed. Standing in front of the Camp Edith tree. This group of curious folks enjoys a good mystery. A side-by-side comparison of the heart-shaped blaze seen in 2017 and 1890. You can still see the original heart outline in the bark of the newer photo. 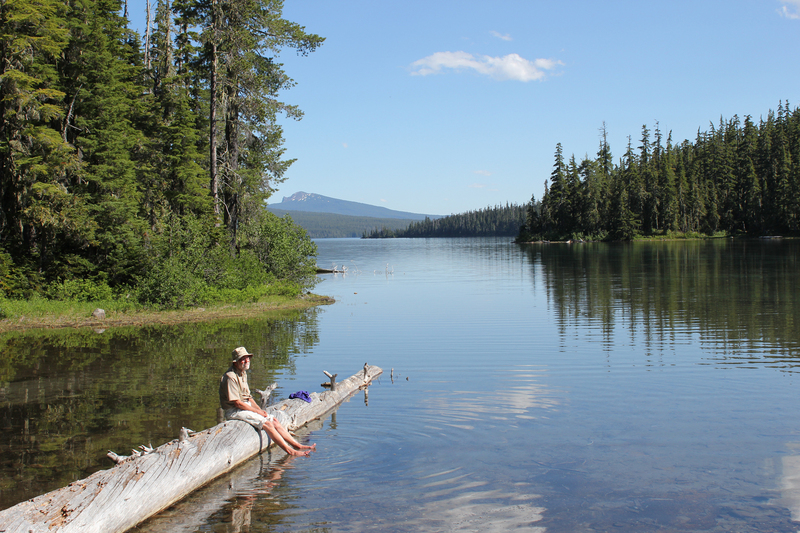 Waldo Lake is one of Oregon’s largest bodies of water, though its lack of amenities such as convenience stores, resorts, and ban of motorized motors upon the water makes this destination easily overlooked. 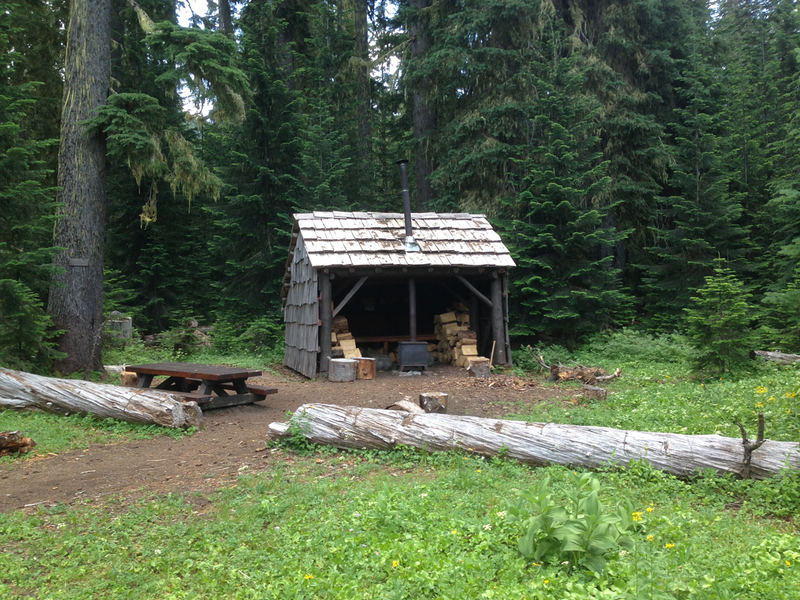 If you’re interested in a great overnight backpacking trip to try the Jim Weaver Loop, a 20.2-mile trail around Waldo lake, here are some photos taken in early July. We parked the car and started from Shadow Bay near the southeastern edge of the lake. Our hike around the lake was in a clockwise direction. We were quickly out of sight from the parking lot and headed along the trail. Near Mile 2. Our first stop was at the South Waldo shelter, it was fully equipped with wood and a stove; this is a popular destination in the winter. We continued on. The south shore had some great views of the South and Middle Sisters. The trail now meandered up the western side of the lake. Close to Mile 5. Overlooking the picturesque Klovdahl Bay. Overhead, the clouds began building into thunderheads; in the distance, we could hear the rumbling crescendo of thunder as though gigantic timpani drums were being struck. 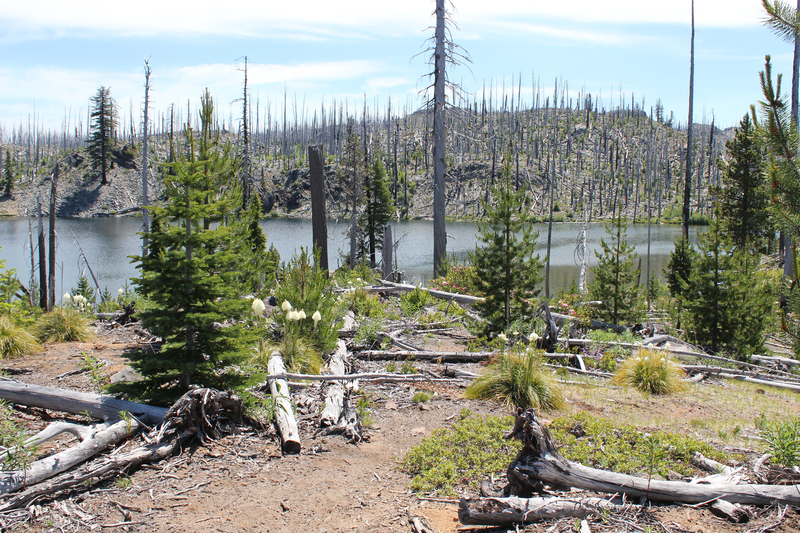 The western trail has a number of places where the forest looks like it had a close encounter with a forest fire; note the scoring on the tree at the right. Mile 10. Continuing north. Seen in the right on the image, about 2-miles away is a scarred hilltop within the burn zone. We spied several campsites peppered along the western shore of the lake, but as we reached the northern shore we discovered a favorite spot was vacant. As evening approached we appreciated a gentle breeze that chased most of the mosquitoes away. Enjoying a gorgeous sunset. The sky was clear that night when the stars came out they were so bright you could almost touch them. 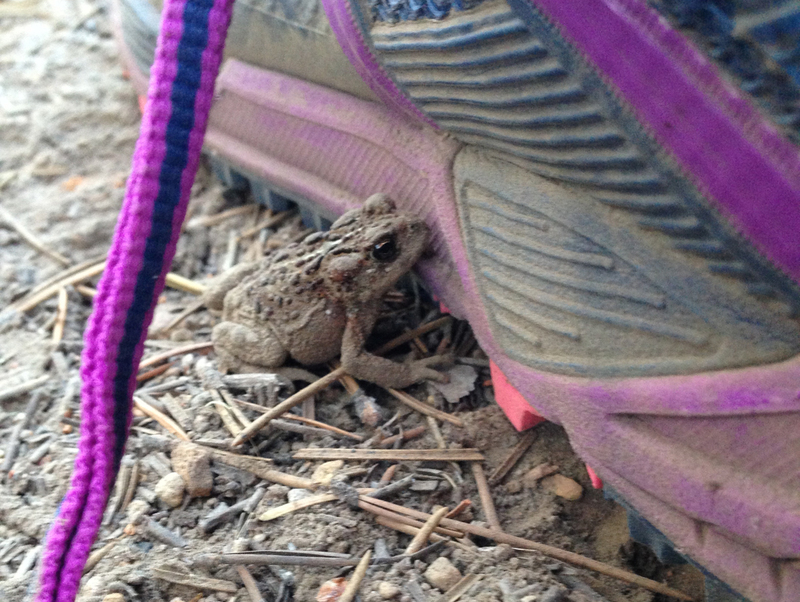 A very small toad had made its home just outside our tent during the night. It was discovered in the morning hiding next to one of our shoes. Roughly Mile 12. Heading east, the trail meanders through the burn zone along the north shore. This day was going to be hot so we tried to cross before the sun rose too high in the sky. 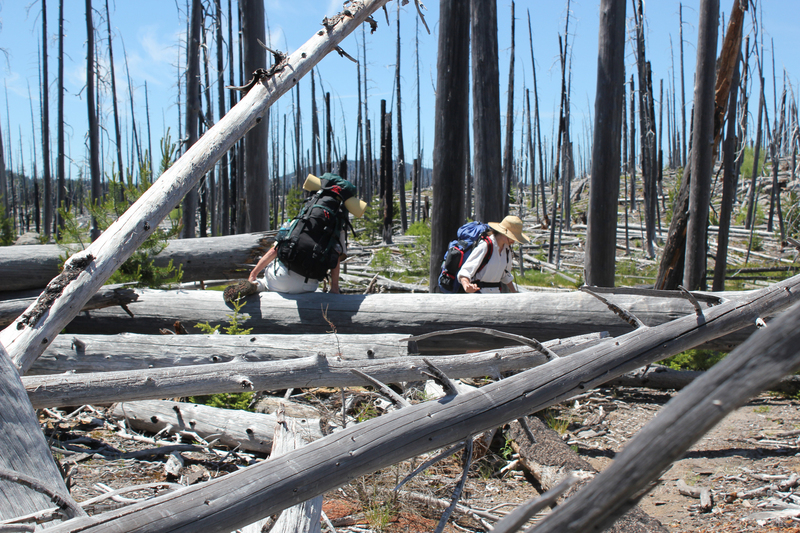 Several weeks earlier, during a scamper through the burn zone, we crossed this section and encountered numerous trees that had fallen across the trail, these had since been removed – thank you Forest Service! Mile 13-ish. Standing on the north shore looking across to the southern shore. The morning was calm, it was difficult to tell where the sky ended and the lake began. Determining the depth of the logs seen the water was difficult, but if the terrain continued its steep angle into the water, these logs were at least 40 feet deep in the foreground and 60+ feet deep further out. 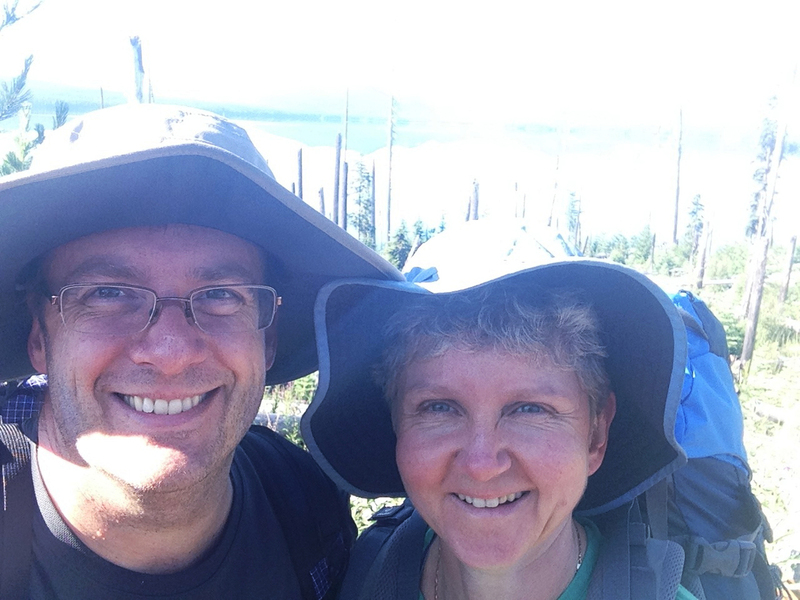 A Couple Selfie taken on the trail within the burn zone. We’re out of the burn zone and heading south along the eastern edge of the lake. 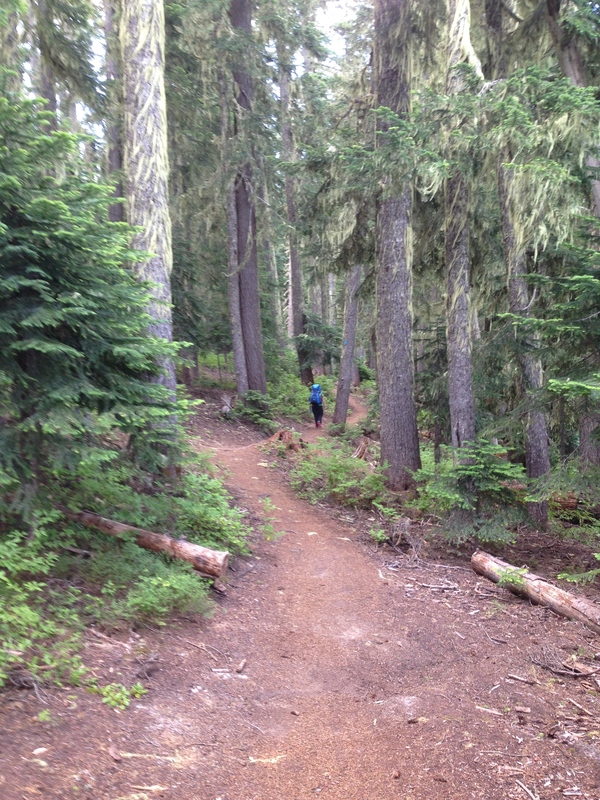 Half of the trail around Waldo Lake is in the woods, with only brief glimpses of the water. Be prepared to see lots of trees. 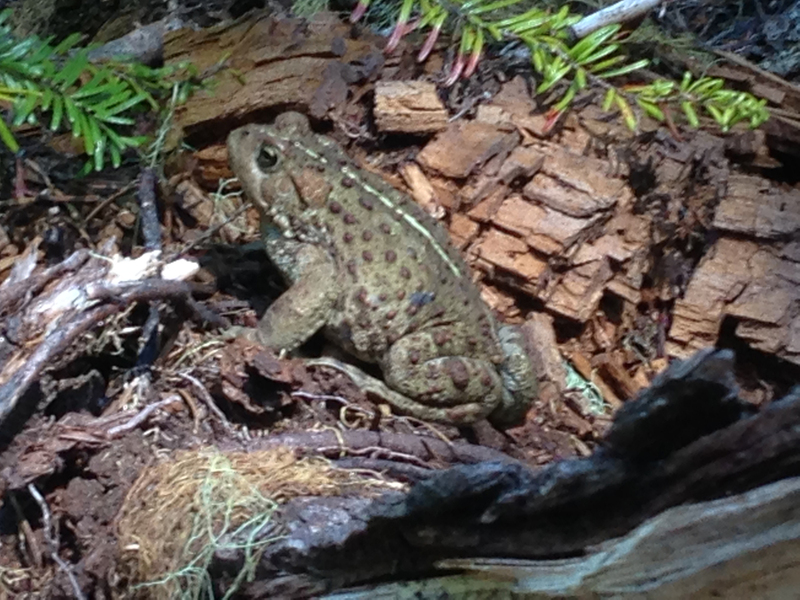 Just as we neared the south shore a massive toad was seen at the edge of the trail eating mosquitoes. During the entire trip, mosquitoes were not a big issue, though the last several miles of the trail we were devoured by these little flying beasts! I was glad to see this toad! Mile 20.2. 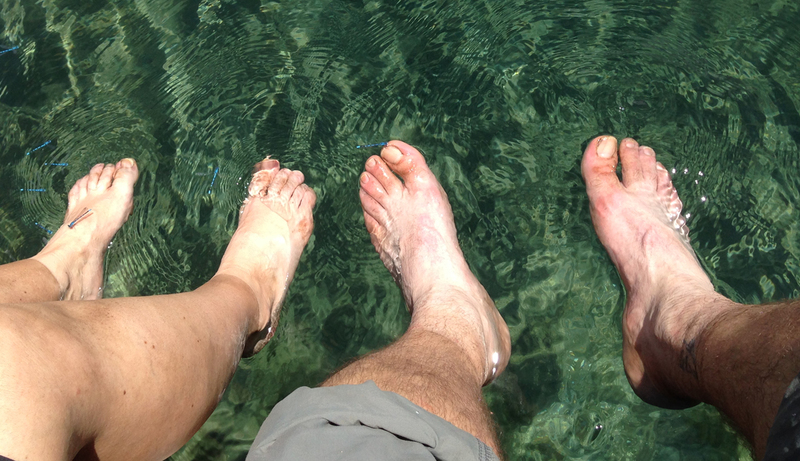 The best part of finishing the loop trail around Waldo Lake is that you can dip your feet into the lake’s cold and clean water. We arrived back at the car the next day. Except for people we saw in the campgrounds, we only saw 6 people on the trail. 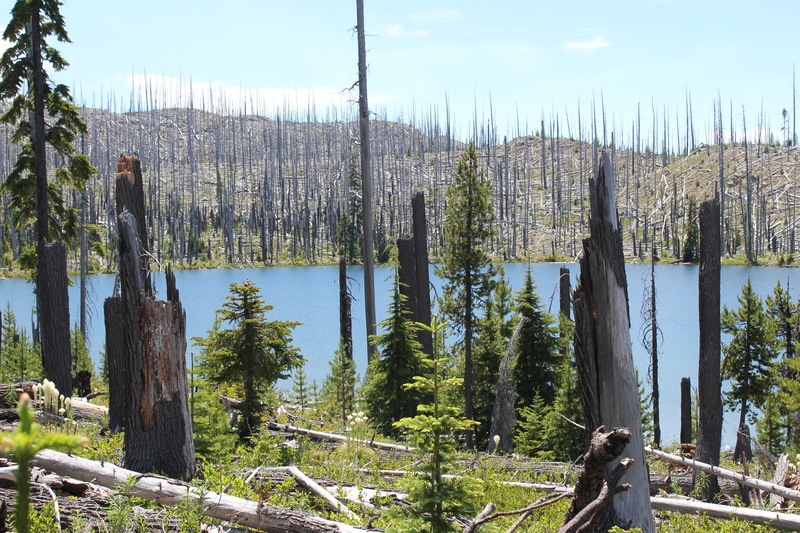 In 1996 a forest fire decimated an area in central Oregon that was roughly 5 miles wide by 3 miles long. 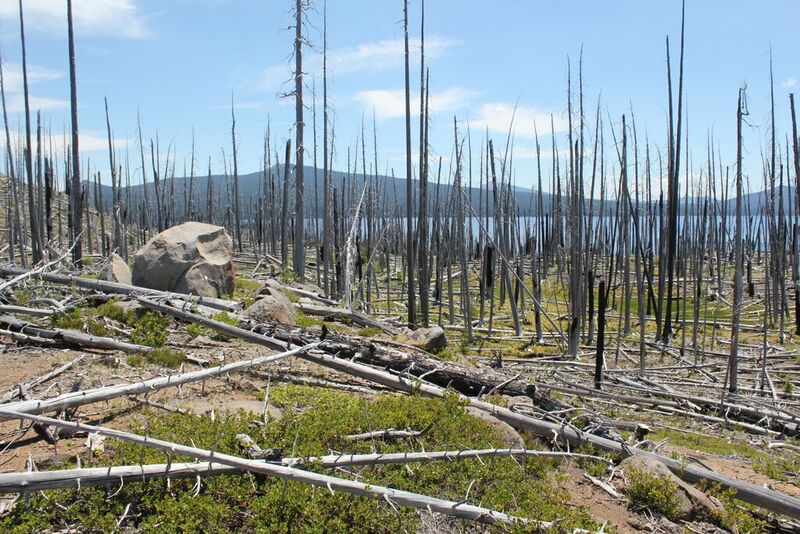 Much of the fire’s southern advance was stopped by the immense shoreline of Waldo Lake – a glacially carved body of water that is 10-square miles in size! The titanic forces of fire and ice have affected this magnificent landscape in dramatic and beautiful ways; all of which are best experienced from the trail. 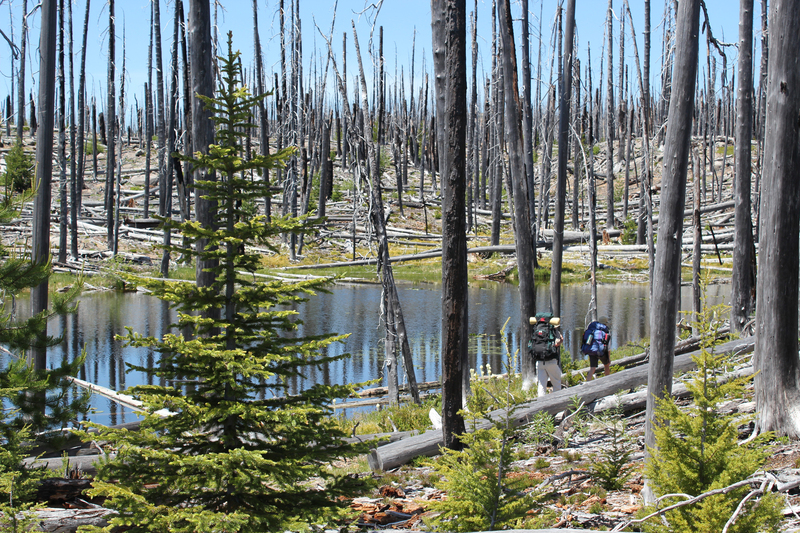 Here are some photos from a two-day, 8-mile backpacking trip along Waldo Lake’s north shore and deep into the burn zone of the Ringdon Lakes area. Hiking along Waldo Lake’s north shore. 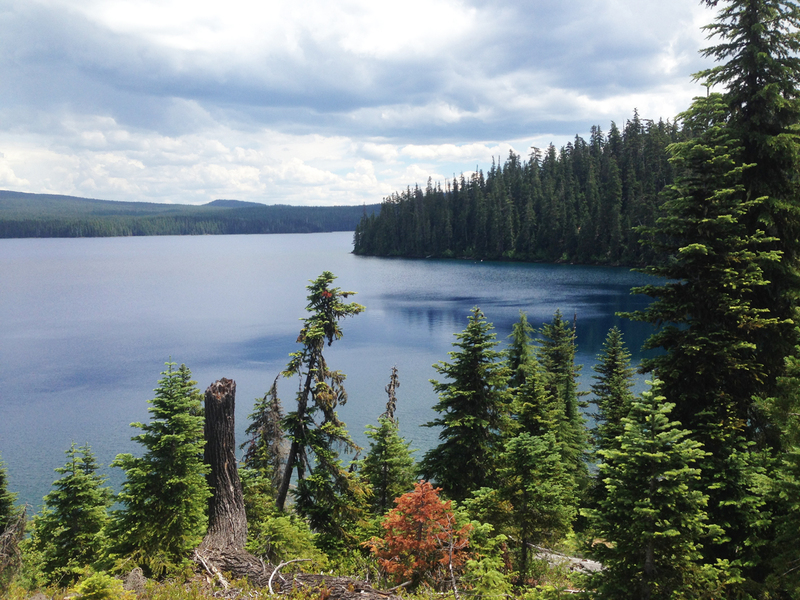 Waldo Lake is considered to have some of the purest water in the world. The lake was named after Judge John Breckenridge Waldo, who is considered to be the “John Muir of Oregon” for his work helping to conserve large tracks of forests in the Cascades. Scampering over and under the “blowdown;” these are trees that have been blown down by the wind. In this case, the blowdown are the trees that burned in the 1996 fire. 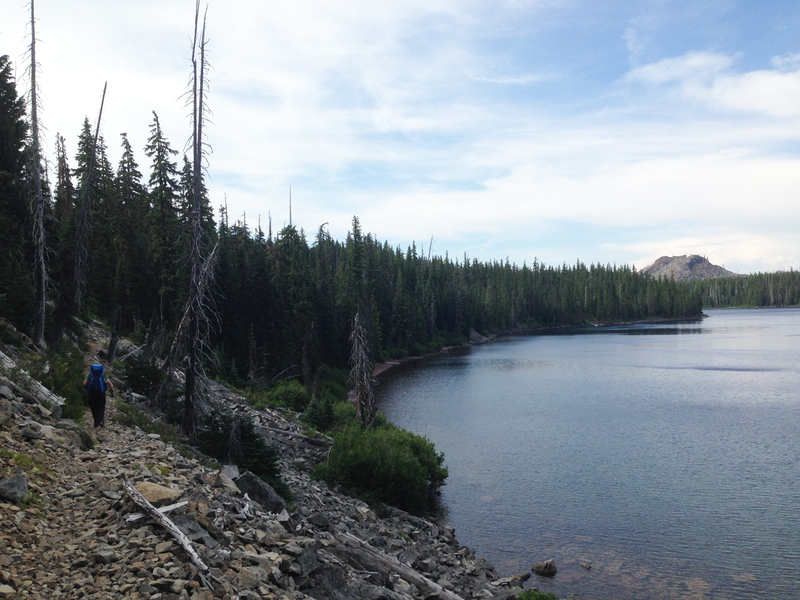 Passing one of the many ponds that dot the northern shore of Waldo Lake. We exited the burn zone and made camp. Shown are several youthful members of the group seen enjoying the shallow and cool waters nearby. If you think you’re too old for backpacking? Just look at Jack, at 70 years old he celebrates life by getting outside. 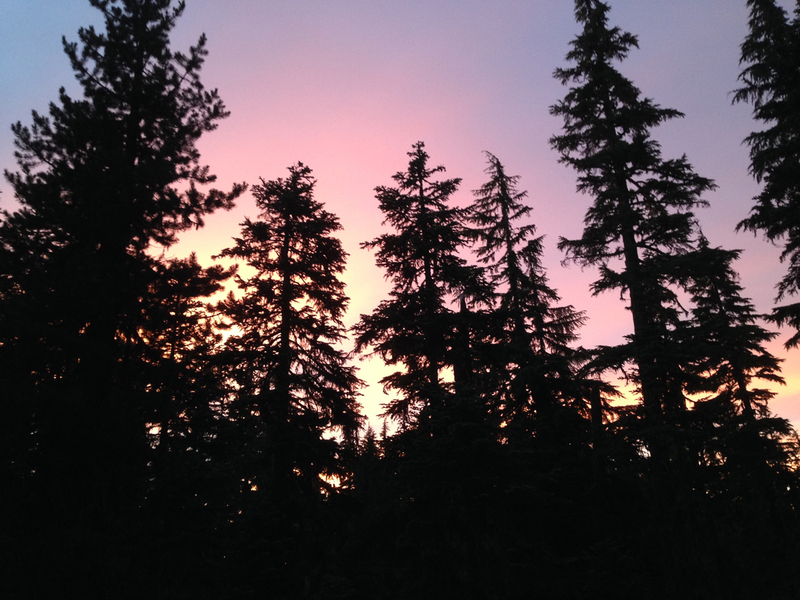 A view of the evening sky as seen from our campsite. 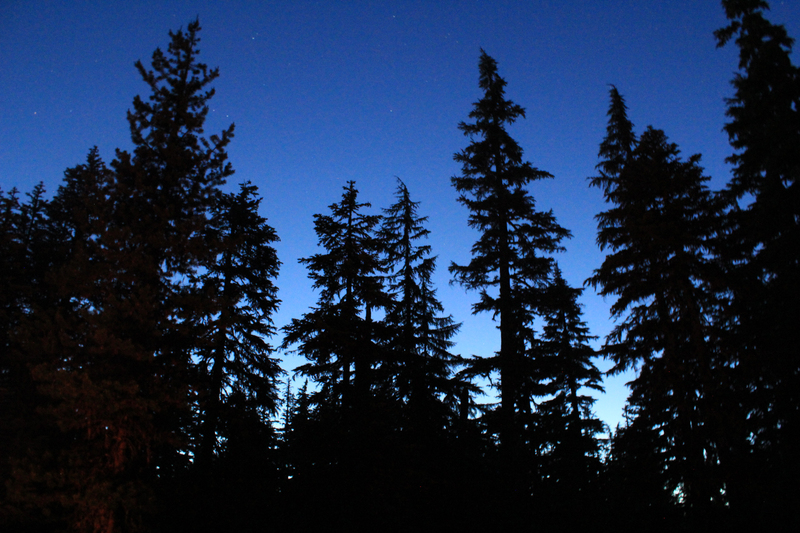 That night we heard only nature’s sounds…which included the buzz of mosquitoes. The night sky was dark on this moonless night. 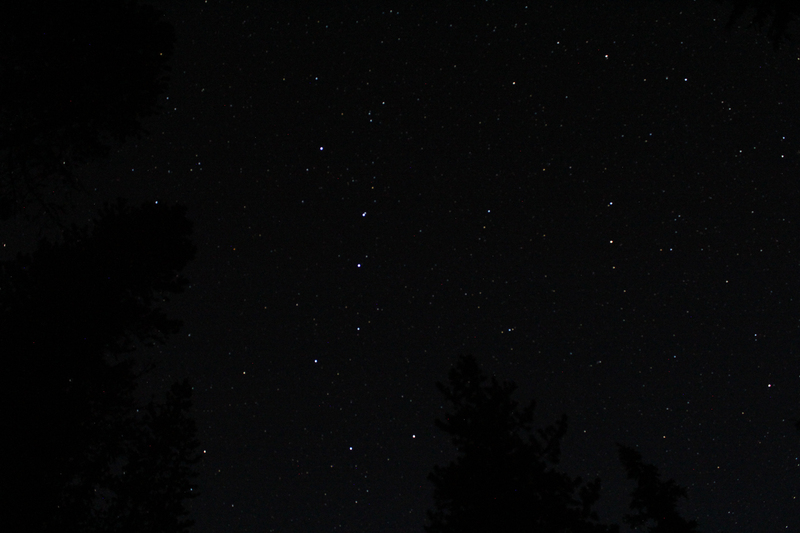 Note the prominent stars of the Big Dipper, in the right of the image, is Polaris (the North Star) and the Little Dipper. To locate Polaris, all you have to do is to find the Big Dipper pointer stars, which are located at the outer part of the Big Dipper’s bowl (seen at the bottom of the image). Draw a line from these and go about 5 times the distance to Polaris. 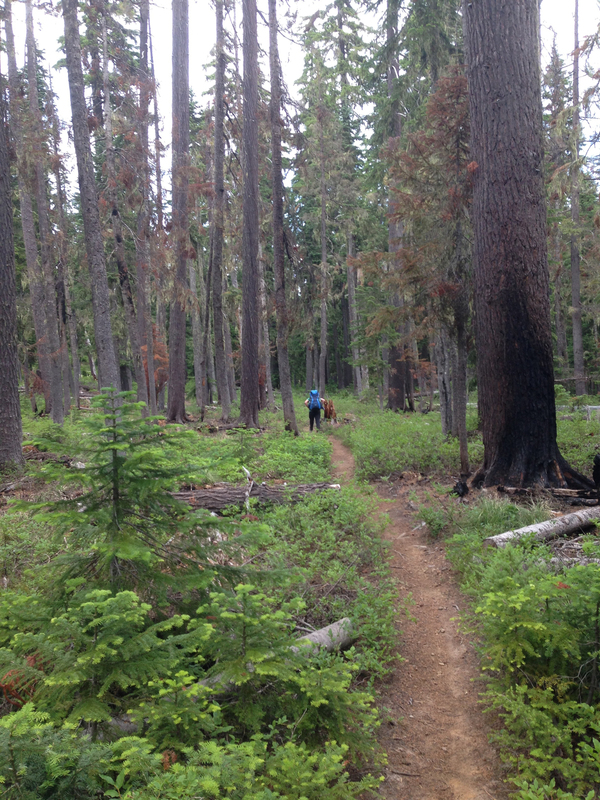 In the morning, the trail led us north, deep into the burn zone of the Waldo Lake Wilderness. The devastation from the fire continued for miles, but new growth was all around us as we hiked. 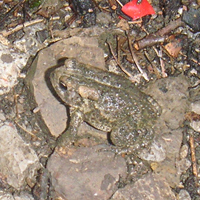 Also observed were several types of bees, a wasp, woodpeckers, and a small toad. Lake Kiwa is shown in the background. The trail junction (not shown) was partially hidden by a fallen tree that also served as the post for the trail sign. 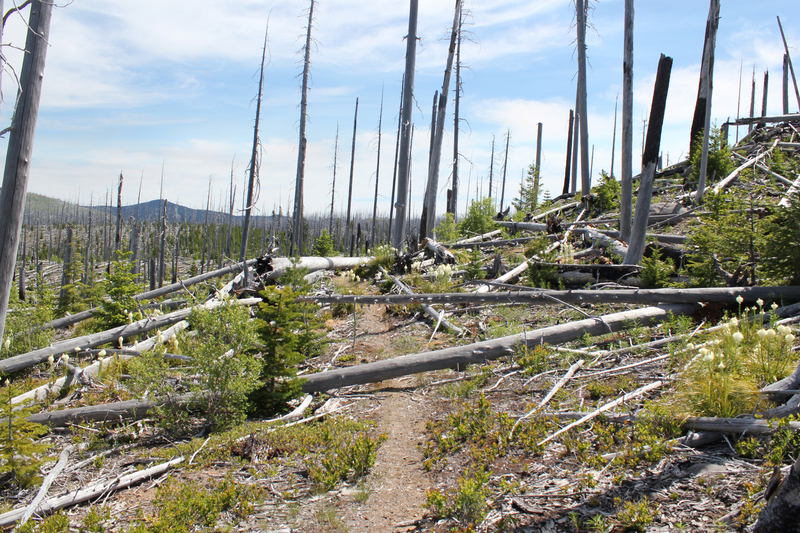 The path returning us to Waldo Lake was heavy with blowdown; this two-mile trail required twice the time because of the number of downed trees we had to climb over – more scampering! 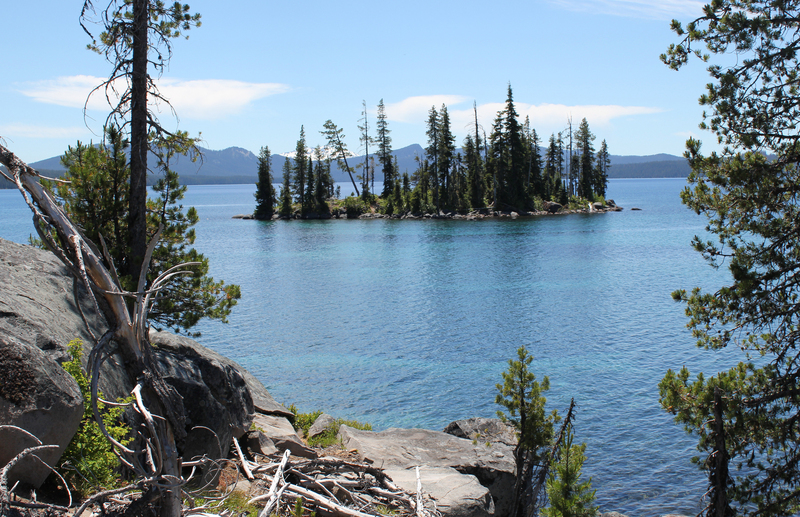 Lower Rigdon Lake offered us the visual treat of a deep blue and some much-needed shade for a short break. Near the top of the hill is Upper Ringdon Lake. 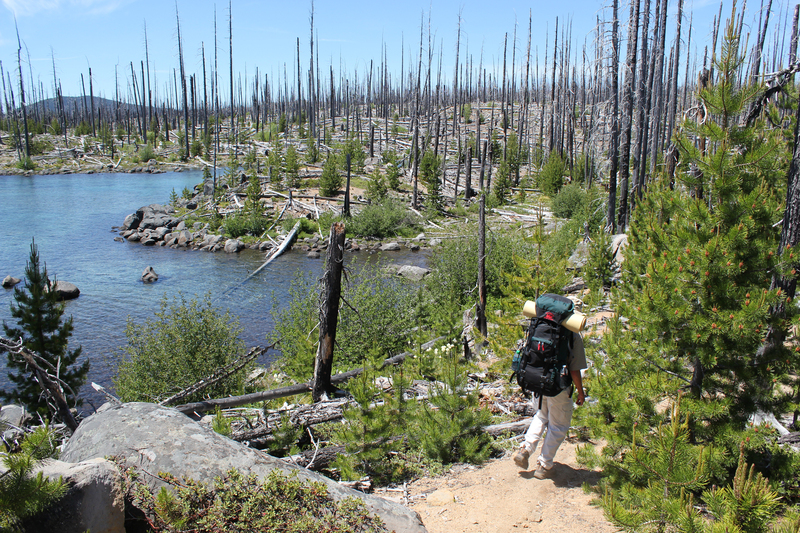 Coming down from the Ringdon Lakes; in the distance is Waldo Lake. Note shown, but interesting; there were areas on this section of trail that frequently crossed flat rocky areas where glacial scouring makes could be seen. 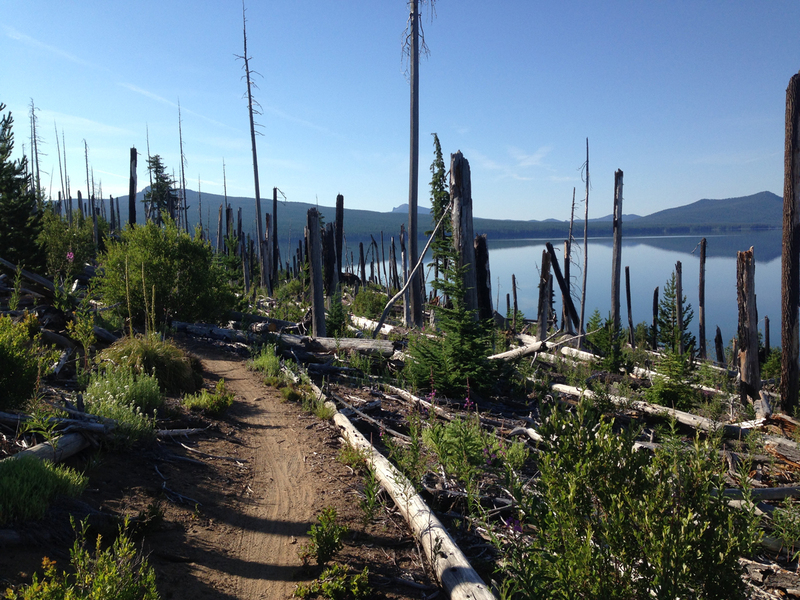 Returning to the shoreline trail we enjoy the sights of Waldo Lake’s varied and picturesque scenery. I received an invitation from the locals to go on another day trip. This trip was near the Bavarian town of Mittenwald, just over the German border from Austria. 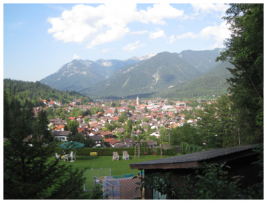 Mittenwald is about a 40 minutes car ride from Innsbruck through some breathtaking country. The kids were going today so the hike would be on the easy side. Our ultimate destination was the inland lake called the Lautersee with a possible side hike to a second inland lake called, Ferchensee. We drove into Mittenwald and parked on a street just out of town. We walked on steep roads and quiet trails until we perceived ourselves to be deep in the woods, but the little side paths that meandered off here and there revealed the town was only just a short distance away. A lot of people, mostly retirees and were out hiking and enjoying the gorgeous setting. The weather that day was just that – gorgeous; not too hot, not too cold, with a radiant sun and low humidity. We arrived at the Lautersee and walked around the edge. This inland lake was of good size and required thirty-minutes, at an honest pace, to walk its circumference. The water was glassy, clear and it’s depths accented with gradient shades of blue. Tall green trees surrounded the lake creating a textured, natural and living wall. If this was not bewitching enough the entire scene was even more entrancing from the enormous sawtoothed mountains that towered aloft. Several buildings dotted the edge of the lake, but we were headed to a man-made family beach area. This area included slides and an elevated merry-go-round that swung the kids over the water. The area adjacent to the beach was grassy and allowed people to sun. 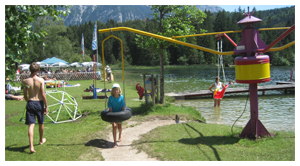 The kids loved playing and the adults swam in the cool waters of the lake. A small cafe sold coffee, beer and fries while a restaurant next door sold more hearty fare. 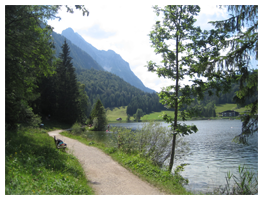 To many visitors, this setting was heaven; I agree the setting was glorious, but my version of heaven involves more hiking so I took the opportunity to venture to the adjacent lake known as the Ferchensee. In fact, I took several such walks that day. 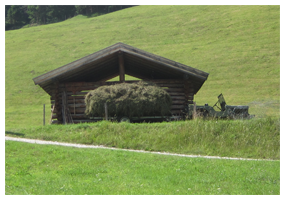 During one of these walks I noticed an old and sturdy wooden barn stacked with freshly dried green hay. Outside the barn was a large flat-bed trailer being pulled not by a tractor, but an old World War II American Jeep. The jeep appeared to be well-loved and was in fantastic condition. A large white star still emblazoned the hood. After a few minutes a shirtless farmer rounded the side of the barn and jumped in the drivers seat, started it up and whirred off, bouncing all the way, to a patch at the base of a hill he was harvesting. The hike to the Ferchensee was very restorative; everything was green, lots of little springs gurgled along the trail, there was an abundance of vegetation, and a variety of toads and insects moved before me on the trail. 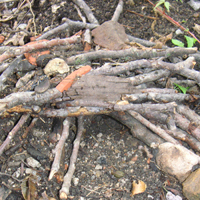 The abundance of animals suggested the environment here was healthy and vibrant. 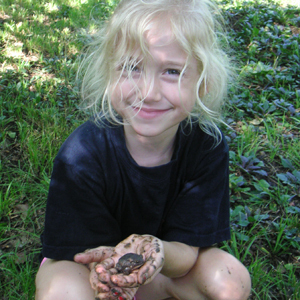 At one point a small snake, who had been sunning itself on the trail slithered into the grass. 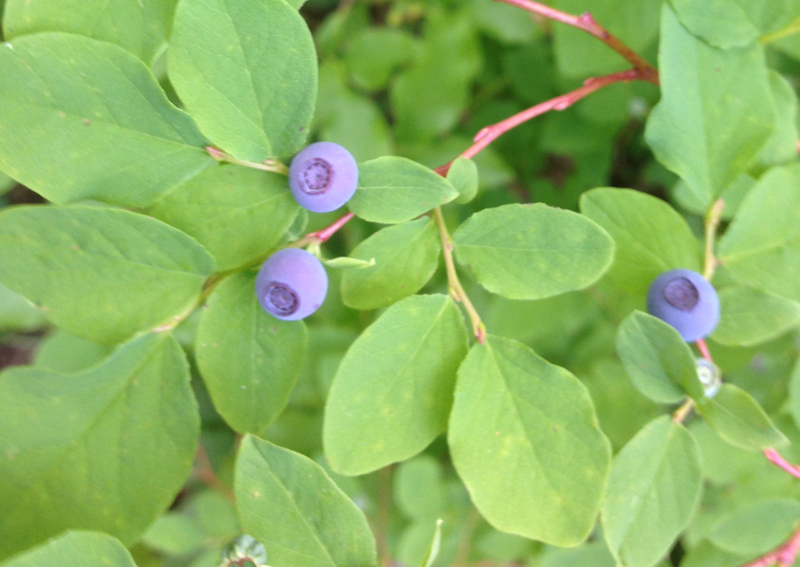 Several people came up and studied it with a keen interest then continued on with there hike. Signs in the area thanked people for visiting and reminded them that the farmers and people who lived there (the folks who hung the signs) obtained their livelihood from this land and to respect that fact. 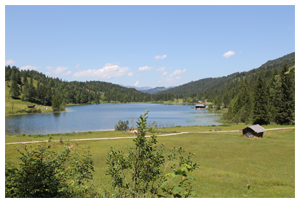 The Ferchensee was exceptionally pretty. A couple of rustic buildings dotted the edge of this gentle looking blue and clear body of water. The perimeter of the lake appeared to be larger than its cousin. The ground around the lake gently sloped and was carpeted with grass. Forests lay at the far end. Most of the people, just a few dozen of them, were laying on the hypotenuse side of this triangular shaped lake in a large green field sunning themselves and having picnics. The hike returning to the Lautersee was equally as stunning as the first; this time I had the pleasure of looking upon the tall and jagged sawtoothed mountains that guarded the nearby town of Mittenwald. Arriving at the family beach area I again felt uncomfortable, it was too crowded. Then my wife reminded me of the obvious – out of scores of people, of all ages, from various countries, speaking multiple languages that …no one was being rude. Out of that entire day neither of us witnessed any rudeness. She was right. Everyone was courteous, and would say (in German – even those from other countries visiting the area) “please” and “thank you”, or “excuse me” when they accidentally bumped someone or walked by their space. There was zero if any trash laying around, the visitors policed their own items; and when finished with food cartons or rental chairs returned them to the office; there were no loud people – no one was playing a radio or talking offensively. If people wanted to listen to music they used an iPod or similar so others would not be disturbed. Of all of the people at that beach, no one talked arrogantly, nor looked like a gang member, nor did I feel out belongings would be ransacked if we turned our backs or went for a swim. People were calm, sensible, level-headed and courteous. The kids were also well behaved! I was, frankly speaking, stunned. I was stunned from the display of exemplary human behavior, but also that I had not been more observant with my own perceptions. For the remainder of the day I enjoyed this tiny spot and observed with a fresh mind as though I had woken from a slumber – I saw it anew. As a traveler, that is my ultimate goal, to not be so comfortable with a situation or place that I only see what I want to see; but instead to see things with open eyes, and the sense of awe that makes traveling, well… fun.